Decentralization of Water-Energy-Food (WEF) systems can have positive and negative effects in urban areas regarding resilience, efficiency, and environmental performance both from infrastructural and institutional perspective. New conceptual solutions for the WEF nexus are needed by designing an integrated conceptual model using advances in Sustainable Supply Chain Management (SSCM). Besides an “end to end” lean strategy (Efficiency Dimension), the strengthening of capacities to absorb disturbances particularly with respect to WEF interdependencies (Resilience Dimension), is considered as a main principle. According to the Intergovernmental Panel on Climate Change (IPCC) it is expected for the coming decades that due to the world’s demographic and socio-economic development in combination with significant effects of climate change, several specifically exposed regions in the world will undergo increased pressure in the availability of essential natural resources and ecosystem services (IPCC 2014). On global scale it is predicted by UNDESA (2015) that by 2030 the world economy will need to produce around 50 % more food and energy, together with 30 % more fresh water, whilst mitigating further acceleration of climate change and adapting to its impacts. Beside the regional effect, this also bears risks for the supply security operated by interregional supply chains and would hinder the affected economies in their development capacities. The Water Energy Food Security Nexus (WEF Nexus) approach is considered a way to frame the interdependent challenges of water, food and energy as well as the natural resources that underpin those systems to align policies for the reduction of trade-offs and to generate co-benefits for sustainable development (Stein, Barron et al. 2014). Climate change was the foremost motivation from the very beginning of the discourse on the WEF nexus (Scott, Kurian et al. 2015). Besides climate change, worldwide urbanization dynamics is identified as a key driver for the fundamental change of the conditions behind the WEF Nexus. Urbanization dynamics lead to both higher energy and water demand rates. Urban systems are in absolute terms dominant factors enhancing climate change through emission and resource consumption and are the main sinks for industrial production (Marchal, Dellink et al. 2011). Management strategies addressing the WEF nexus show an urgent demand for systemic solutions, with a backdrop against interlinked urbanization processes and demand/accessibility shifts within respective ecological and socioeconomic regimes. Being not remarkably addressed yet, the current concepts face substantial risks for interregional supply chains, with less effective analytical monitoring of the WEF nexus as well as resulting less potentials of adaptive governance, management and technology improvements to meet supply goals. Basically water and energy can be considered as “co-flow” supply chains alongside a food supply chain (Ibara-Vega 2014, Cuervo 2013). Both are related to sustainability assessment (SA), quantitative measurement and monitoring of flows of environmental assets within food supply chains (at each stage of the chain). Vertical integration over food, water and energy flows and respective SA’s ensures a new WEF orientated management standpoint and integrative decision making processes with respect to the horizontal as well as the vertical dimensions of the entire SSCM system (Fig. 1). In such a way especially those parts of the food industry with a high water and energy intensity could elaborate resilient and efficient stewardship concepts of water and energy resources contributing significantly to the WEF security and resilience. We found that an SSCM based approach towards the WEF nexus shows relevance in leading to higher adaptation and stabilization with respect to supply effectiveness. Moreover it identifies a strong lever function for further climate change mitigation strategies. Sustainability management is realized beyond that with Integrated Platforms acting in vertical as well as in a horizontal direction: Integrated SA Platform and Integrated SSCM Platform. The latter will optimize the network in terms of decision making; resulting in higher efficiency and resilience. The Integrated SA Platform will introduce new dimensions for decision rules and operation of the network. Applied to the specific context of a food supply chain with its specific network the model can be already transferred into IT based/ supported planning and decision making tools. In the end such an approach is able to stabilize local, regional and international value chain systems with the benefit for all value chain members. The food system and its interrelation with the water and energy systems are becoming more tangible and can serve as a first step towards modeling the System with System Dynamics. 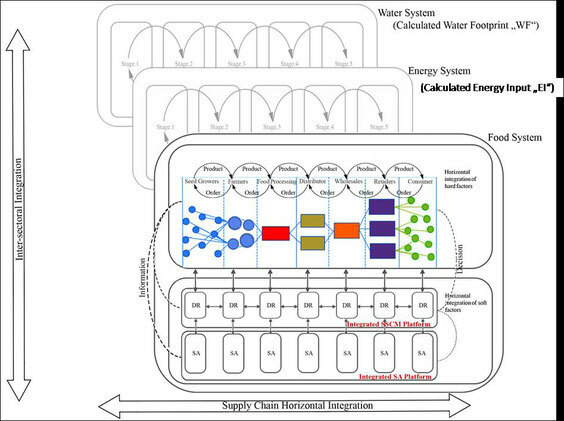 Further, quantitative optimization for bio-energy and food supply chains, also integrating tradeoffs and flexible variants, based on Agent based Modeling and Simulation (ABMS) could explore a higher detailed range for case based supply chain planning and execution, also giving concrete guidance for geographical distribution pattern in regional settings and/ or business/ supply cases. Organizational boundaries are important to understand the WEF system. While most water, energy and land-use planning, decision and policy making occurs in separate and disconnected institutional entities, the behavior and evolution of the WEF system, which place a limit to the success of each organization, is first and foremost determined by interaction of those decisions, not the decisions themselves. Investment decisions, for instance, should be informed by both the current conditions and future plans in other sectors. This requires effective communication and cross-sectoral collaboration. Marchal, V., R. Dellink, D. Van Vuuren, C. Clapp, J. Chateau, B. Magné and J. van Vliet (2011). "OECD environmental outlook to 2050." Organization for Economic Co-operation and Development. Scott, C. A., M. Kurian and J. L. Wescoat Jr (2015). The water-energy-food nexus: Enhancing adaptive capacity to complex global challenges. Governing the nexus, Springer: 15-38. Stein, C., J. Barron and T. Moss (2014). "Governance of the nexus: from buzz words to a strategic action perspective."